©1996 Bill Berends Music. ALL RIGHTS RESERVED. 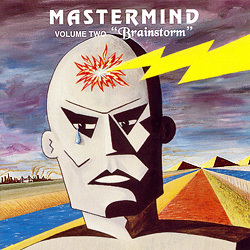 Released in Dec. 1991 by ZNR Records, BRAINSTORM has been steadily gaining in popularity over the years and the driving 22 minute title opus is a mainstay of Mastermind live shows. Digitally remixed and remastered, sales continue to grow making this the most popular of the early Mastermind albums.